Play Sonic The Hedgehog 2 Now! The Sonic The Hedgehog 2 game manual reads:Robotnik Returns! holding me in a place called the crystal egg. In order to free me you have to find and bring the six chaos emeralds. don't know what he has planned, but Sonic, please be careful! dashed off to find the Chaos Emeralds and save his friends. 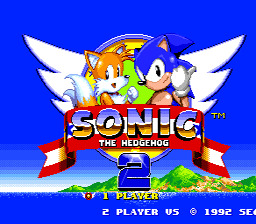 Sonic The Hedgehog 2 had all the cool aspects from Sonic 1, but with some awesome additions. One of the coolest was the ability to hold down one of the buttons to spin out so you can get a boost up to full speed without the need for room to get a running start. Another big improvement was the ability to play with a friend. The half-pipe bonus levels on Sonic The Hedgehog 2 added to the cool factor as well. At the title screen, press down twice and press a to enter the options menu. Play 19 65 09 17 in the sound test. Then press C + Start to go back to the title screen. Hold A and press start to enter Level Select. Collect all the Chaos Emeralds, get 50 rings, and hit A when in the air to transform into Super Sonic. You will be invincible and super fast, but will drain 1 ring every second.